Technically speaking, lawn aeration is the natural process of air exchange between the soil and the surrounding atmosphere. For our purposes; lawn aeration is the process of mechanically removing small plugs of thatch and soil from the lawn to improve natural soil aeration. Lawn aeration is commonly called “core aeration” in the lawn care industry, and you may have heard of it as soil cultivation (coring, spiking and slicing). 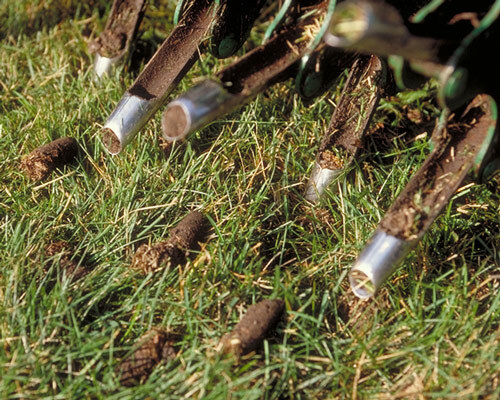 Lawn aeration or coring is the practice by which hollow tines or spoons are used to extract cores from the turf. The depth of coring usually ranges from 3/4 to 2 1/2 inches. Have you noticed that your grass is not looking as good as it could or that after a rain your lawn has difficulty absorbing the water? Those are signs that you may need to have a lawn aeration service. Another indicator that your lawn may need a lawn aeration is to dig a 6” deep square-foot section of grass with a sturdy shovel and look to see if the roots of your sample are over 2” deep, if not your lawn would benefit from lawn aeration. Note: If you have had your lawn seeded or sodded within the past year lawn aeration is not advised. Release of toxic gases from the soil. Improved wetting of dry or hydrophobic soils. Accelerated drying of persistently wet soils. Stimulated root growth within the holes. Increased shoot growth atop the holes. Disruption of soil-layers resulting from topdressing. Control of thatch, especially where soil cores are reincorporated. Improved turfgrass response to fertilizers and grub prevention. Better results for over-seeding the lawn.